Sobriety tests and DUI stops in Glendale, Arizona are often paired together. Sobriety tests can either work in your favor, or put you in serious danger of being charged with a DUI. But what exactly are sobriety tests, and can you really fail them if you aren’t drunk at all? DUI lawyers like the team at My AZ Lawyers in Glendale are available to help you if you are in a worrisome DUI situation, but it is important to arm yourself with knowledge should you be in a situation where you fail a sobriety test while sober. What is a sobriety test? Field sobriety tests are tests implemented by officers during a DUI stop to test how sober a driver is. The three standardized tests used in testing sobriety at a DUI stop include the Horizontal Gaze Nystagmus (HGN) test, the Walk and Turn test, and the One Leg Stand test. Other tests that may be implemented include the Rhomberg Balance Test, the Finger to Nose test, and the Finger Tap test. All of these tests are used to gather probable cause, meaning they can reveal a possible drunk driver’s poor coordination, balance, and motor skill imparement as a result of consuming alcohol or other drugs. These tests are definitely flawed and unreliable, and one could fail the test completely sober. For example, factors like tiredness, physical problems or disabilities, natural affluence for being clumsy or unbalanced, anxiety, nervousness, and poor interpretation on the officer’s part could all cause a perfectly sober law-abiding citizen to fail a sobriety test. Absolutely. If an officer tells you that it is not optional or fails to mention that sobriety tests are optional, you may have a case in Glendale for being misinformed and having your rights violated by the officer. However, there are some dangers involved in refusing a field sobriety test. As local Glendale law says (and the officer who suspects you of drunk driving must legally tell you), you may be asked to consent to alcohol testing if you are suspected of drinking and driving. Refusal to do so can result in the suspension of your license. However, it is not outright required for you to take an alcohol test and there are no criminal consequences for refusing. More often than not, it may be a wise idea to submit to testing. However, if an officer forces you to do so, your rights may be violated and a case could stand up in a court of law. If you have been wrongly forced to submit to alcohol testing, it would be wise to seek out a DUI lawyer or a DUI defense attorney in Glendale to see if you have a case against the officer in question. Arizona is considered a no tolerance state, and the repercussions could be dangerous if you fail a sobriety test. A no tolerance state allows one to be arrested for having a blood alcohol content (BAC) of less than the national legal limit of 0.08 percent. There are several types of DUIs in the state that take into account blood alcohol content levels and additional factors like previous offenses. What should I do if I fail a sobriety test while sober and I am facing DUI charges? It is completely unfair and unconstitutional that a law abiding sober citizen is being charged with a DUI that they didn’t commit. It is important to remember that despite the risks in refusing a sobriety test, you can absolutely refuse to take them. Contact your DUI lawyer immediately following the arrest if you are a victim of poor sobriety testing. You may have quite a case against the officer’s poor judgement. 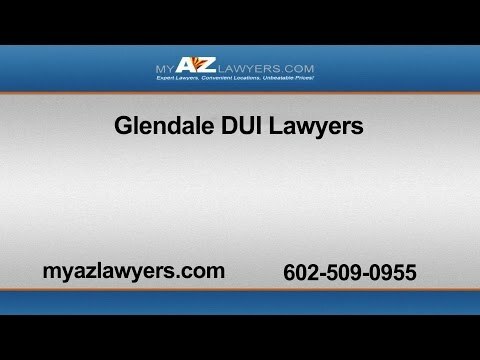 I need a DUI lawyer in Glendale, where can I find help? My AZ Lawyers should be your first stop and your first number to call following a wrongful DUI arrest while sober. We are a professional limited liability company that boasts a team of excellent DUI lawyers, bankruptcy lawyers in Glendale, divorce lawyers in Glendale, and criminal defense attorneys in Glendale. If you’ve failed a sobriety test when you weren’t drunk and are not facing serious DUI charges, give us a call so we can give you a consultation of your case. We may be able to pair you with a talent, specially trained, and experienced DUI lawyer that can help you with your case. Contact My AZ Lawyers today to learn more and get the defense that you deserve.